Fantastic news & well done to all – keep up the great work! As you settle in to your Summer and the last league games become a distant memory, fear not! We have organised some competitive games and events over the next few weeks to help keep your wood-pushing withdrawal symptoms at bay. 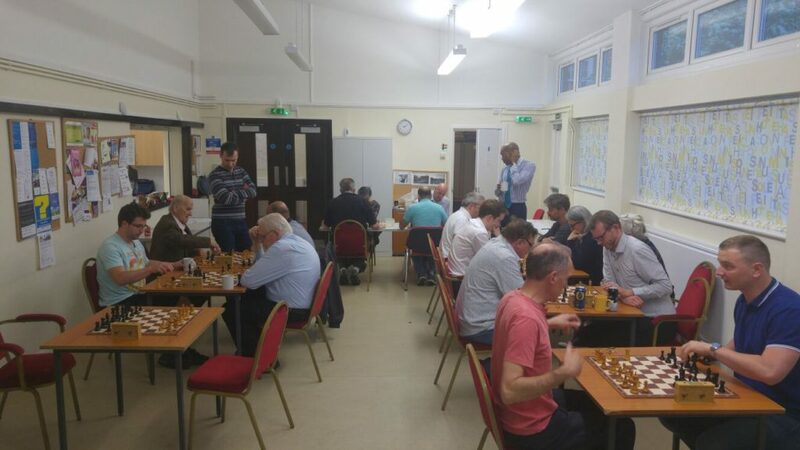 The first of two games in what’s been dubbed the West London El-Chessico, sees Hammersmith take on Battersea over 12 boards in an ECF rated game at the Albion. Battersea are a great club with a rich history and some very good players. Should be a competitive & enjoyable evening! 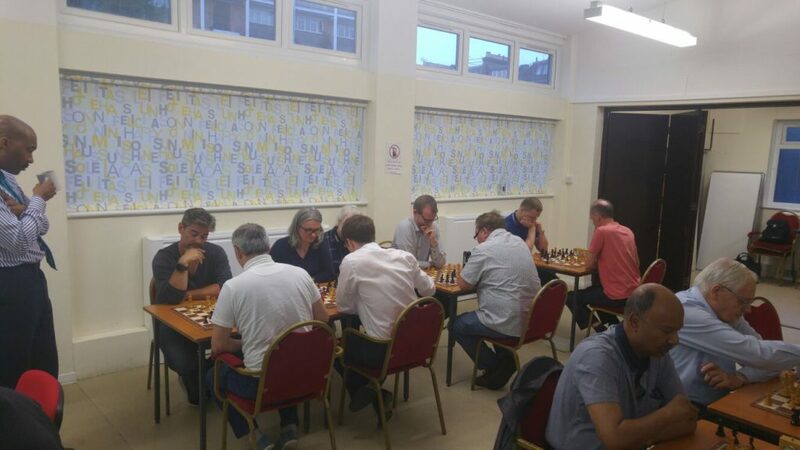 Women’s International Master and former Hammersmith player Sue Maroroa takes on Hammersmith Chess Club in a 20-board Simultaneous at the Albion. Sue ranks in the top 10 female chess players in the UK so this is a fantastic opportunity to get some game time against a top class opponent. Members and Non-Members are welcome so get in touch if you would like to play. The return leg of El-Chessico sees us head down to darkest SW London to play Battersea on their Home Turf at the Battersea Labour Club (very close to Clapham Junction). Who will win bragging rights?? If you’d like to participate in any of the three events please get in touch via your team captain or email us! Alternatively you can swing by on a club night and speak to one of the team – full details here. Author HammerPosted on July 11, 2016 Categories Club UpdatesLeave a comment on Summer Chess Events! All – please note that due to other commitments we have had to change the date of our Simultaneous game against WIM Sue Maroroa. The event will now take place on Monday July 25th. All other details remain the same – save the date!! It has so far proven very popular, so please let us know if you would to play. 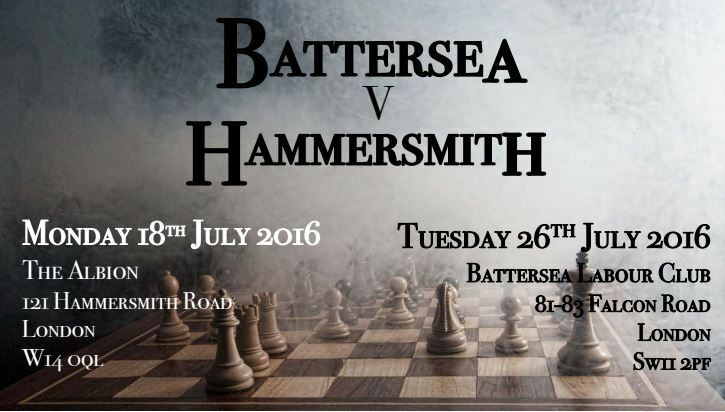 We’re also looking for players for our two upcoming games against Battersea Chess Club. Get in touch with us or your team Captain if you’d like to play in either event. As Summer approaches and the Chess Leagues take a well-deserved break, we are lining up some exciting events of competitive and fun chess to keep our collective fingers on the chess pulse! The first Event we are pleased to confirm is a Simultaneous display against Women’s International Master Sue Maroroa. 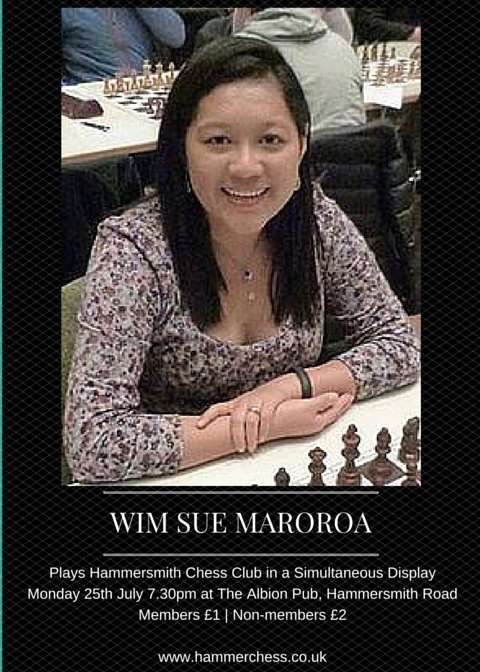 Sue is a former Hammersmith Player, and with an ECF rating of 213 currently ranks in the top 10 female players in England. 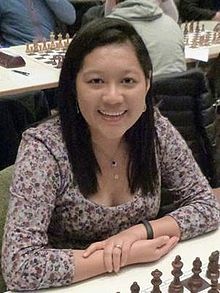 She is a former New Zealand Chess Champion, has played at several Olympiads, achieving the WIM title in 2009 and later achieving International Master norms in 2014. Definitely a force to be reckoned with! The event will be held at the Albion on Monday 11th July, starting between 7.30 and 8pm. We have space for 20 boards on a first-come first-served basis – if you’d like to reserve a spot please get in touch or leave a message below. Club vs Club challenges – we’re currently in touch with some other London clubs about arranging a Club v Club game across 8 or more boards. 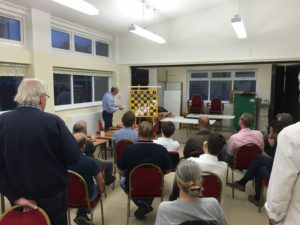 A great chance for some competitive chess, particularly for our newer players. 30 Minute Club Tournament – an internal tournament that will run throughout the Summer, involving several games for all players involved. 10 Min Blitz Tournament – similar to other blitz-tournaments we have run this year, we’ll have an evening of blitz chess for all-comers. 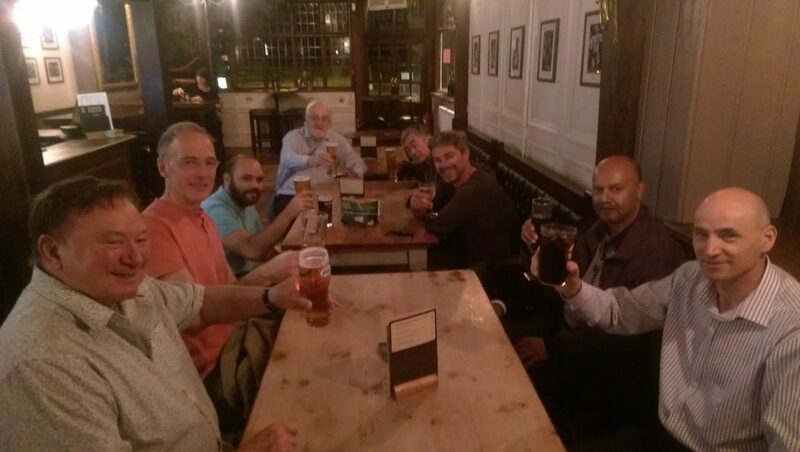 Chess Pub Crawls – we’re lucky that the club is based in a part of London blessed with very good pubs! So why not combine the two in the form of a chess pub crawl! We’ll see how your Benoni looks after a few pints! Chess Charity Day in Association with MIND – we are organising some open air chess in Lyric Square, Hammersmith, on September 10th as part of a MIND-charity day. A great cause and should be a fun day playing games against the public in the open air! Hopefully the weather is good to us. Author HammerPosted on June 7, 2016 June 8, 2016 Categories Club Updates2 Comments on Annual General Magic – The 2016 AGM! King’s Gambit – Sheikh Style! Our third and final look back at the archives (for the time being), is this truly devastating example of the King’s Gambit from Hammersmith’s own Sheikh Mabud in 2009. Aggressive, dynamic chess at its finest. Take a look – here. Author HammerPosted on June 4, 2016 Categories Club UpdatesLeave a comment on King’s Gambit – Sheikh Style! A flurry of activity in May saw the conclusion of most of the leagues we play in, bringing with it a large dollop of success (and a tiny drop of failure) for the Club’s teams! As it was the May Day bank holiday, the Club did not open! Unfortunately the penultimate round of games in the Middlesex League brought with it confirmation that Hammersmith are relegated to Division 3 along with Harrow next season. A 5-3 win over Ealing brought some consolation. The final match is against Kings Head on 16th May. This game completes the Second Team’s campaign for this season. Some consolation is brought by us winning our final game 5-2, with one adjournment. Dave Lambert has captained the side with excellence this year and I’m sure he will look forward to leading the side in 2016/17. We had a marvellous turn out with 14 members present, including two first-time callers. The theme of the evening was tactics. John White talked through a game of his where some clever tactical play secured him a win. Bajrush then analysed a game of his where he used his own opening “The Steamroller”, winning in short time. Unfortunately we had no time for the planned blitz tournament so the remainder of the evening was quick fire chess. A thumping 6-2 win rounded off a great season for the Division 4 first team. We are promoted!!! Well done to John and his team. A clean sweep in our final game saw us finish the season as Champions!! Brilliant well done to all the many players who participated in this league and huge thanks to Dave who took the reigns for this last match. A fine final win (4.5-2.5) from our Thames Valley side clinched 1st place and we are Champions of Division 2! Promotion to Division 1 is the order of play next season. Many congratulations to Bajrush and his team for this superb effort. A Committee Meeting lasting nearly 2 hours took place. 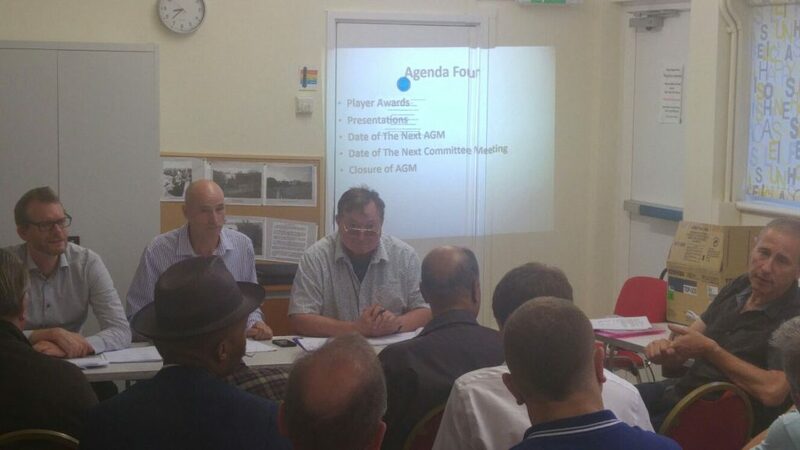 Reports from all Officers were presented in preparation for the AGM. Following this, Bajrush gave another of his game demonstrations using his by now famous “Steamroller” attack. On completion we all enjoyed some blitz chess. 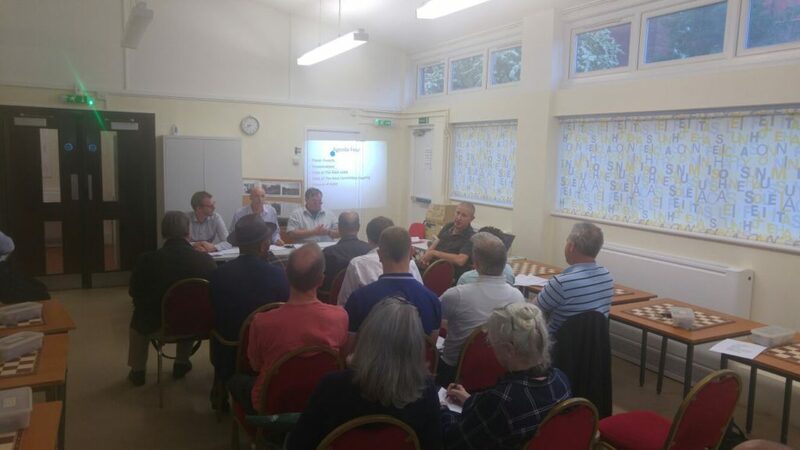 Another fantastic turnout with no fewer than 17 members in attendance. Our season in Division 5 ended in a 3-1 defeat. We have had a tough time of it in this league but with a new captain on board for next season and a number of new members, things should soon improve! If you’d like to help out with running a session please drop us an email. They are short, fun, and you’ll play some crazy chess! 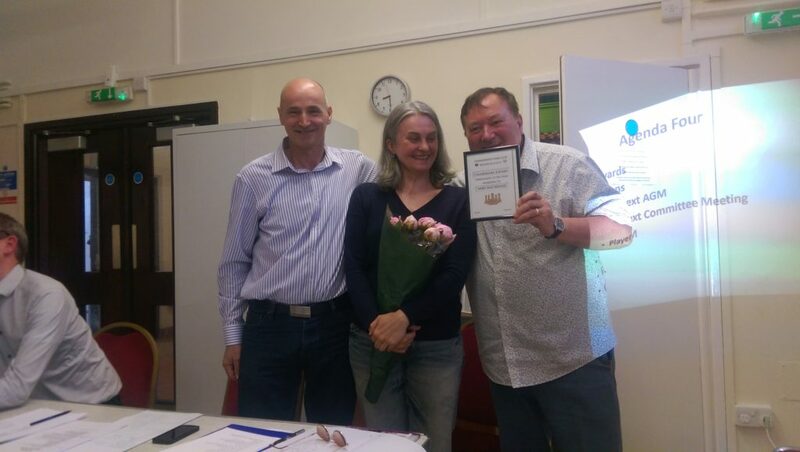 Thank you to all our members and players this season, and to Anda for the great job in running the Library evenings! We now look forward to the AGM and our Summer activities, and a new season of chess in the not-too-distant future!